When the story opens, our heroine has just found a woman dead in the bath. She realizes the implications - she's going to trial that day and this won't help her case - and quickly decides to switch identities with the dead woman and make her escape. Now we are taken back to her childhood and get to know Axie Muldoon as she was growing up, poor and orphaned, before she reinvents herself as Madame de Beausacq, a controversial midwife in who provides birth control and abortions. 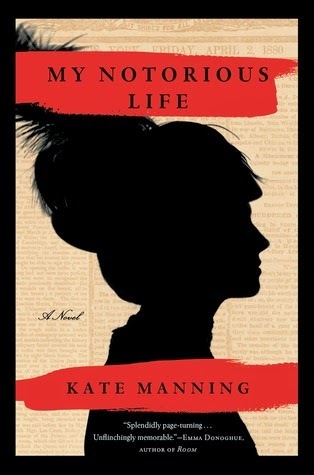 Based on the life of Ann Trow Lohman, My Notorious Life is not only a compelling story of one woman's rise to success, but also a condemnation of the sorry state of women's reproductive rights in the 19th century. Axie, who was called Ann as an adult, went from being a young girl horrified at the idea of abortion to a woman who provided them. She never found it pleasant work (and the descriptions are chillingly graphic - anaesthesia was not available) but she knew in many cases it was a matter of life and death for the women. This was something her foes, like the moralistic Anthony Comstock, could not understand. I found Ann to be quite strong and admirable. Despite the risk she put herself in after the Comstock Laws were enacted, she continue to help women. It was something she felt she had to do, and despite how much she enjoyed and flaunted her wealth, she did what she could even for women who couldn't pay. I did feel a bit unsettled about her material greed, but chalked it up to her impoverished background. One of my favorite aspects of the story was Ann's relationship with her husband Charlie, because it was so complicated. They met on the orphan train and found each other again later and became a couple. Though they were devoted to each other, Charlie would leave for days at a time with no explanation and just repeatedly told Ann to trust him. Given that her mantra was "Never trust a man who says trust me," it was a constant struggle not to doubt Charlie. The first page of the novel is a letter introducing the book as a found memoir "belonging to my great-great-grandmother Ann" and including some corrections by her husband who blacked out some words. None in fact are blacked out, but swear words and others that may have been objectionable like "crap" and "abortion" are riddled with asterisks. That didn't bother me as much as the words that appeared in ALL CAPS. I guess this was supposed to be how Ann talked, her language also rough with poor grammar. The style was a little distracting, and definitely set the novel apart stylistically from others I've read set in this period. I don't know how realistic it is that after gaining so much wealth and success she still spoke like a street urchin, but I guess her only education was of a pretty specific kind. On the other hand, her husband was an aspiring journalist who at least at one point attempted to improve her speech, and you'd think his more educated diction would rub off on her. My Notorious Life was, in many ways, reminiscent of the Victorian novels of Sarah Waters, and Emma Donoghue's Slammerkin. I became engrossed almost instantly in this morally complex feminist novel, caught up as much in the vivid details of daily life as the larger struggles endured by the characters. I don't think it got much press, which is too bad - it's very good! A friend of mine recommended this one, and I enjoyed it a lot. I also have been surprised by the lack of press for it. I've heard of this one. Not sure if I will read it soon, but it does sound like a novel I would pick up. I am finding it quite engrossing. It paints a very graphic picture of what women had to endure at that time. Yes, I loved all those details, though it was kind of horrifying.